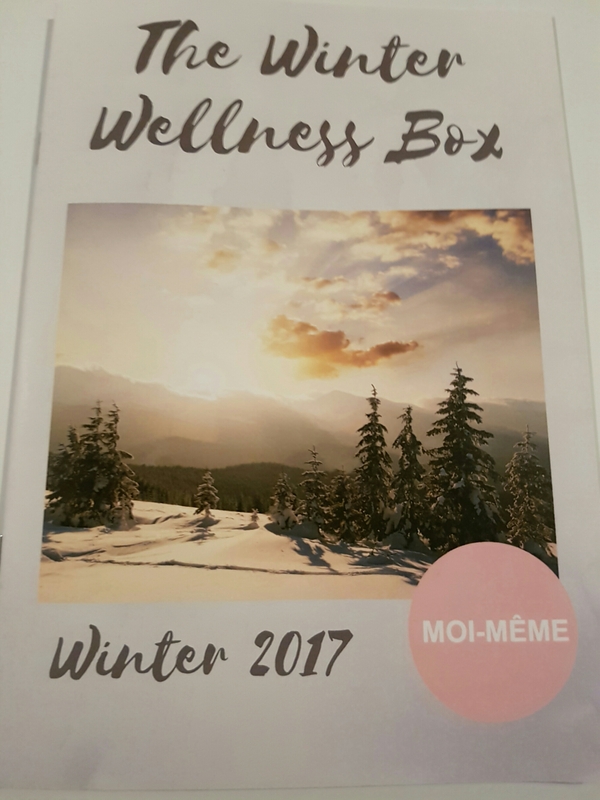 This box is so luxe- and will with things to give you a boost during the rotten cold winter months. 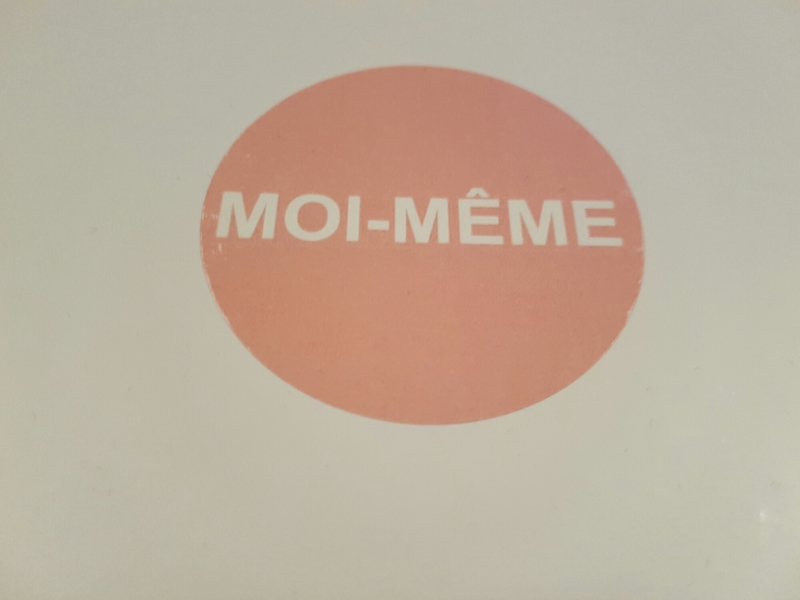 I love that each box is personalised and that the team at Moi-Meme do the same with the contents. There are five lovely things in the box and I can’t pick a favourite. Lola’s Apothecary Bath & Shower Oil (RRP £34 100ml) – this oil (Delicate Romance) contains rose, sweet orange, lemon, geranium, as well as several other skin loving ingredients. You only need a teaspoon for a bath or shower, so this will last a while. Based in Devon, the products are hand blended in small batches for the best quality. 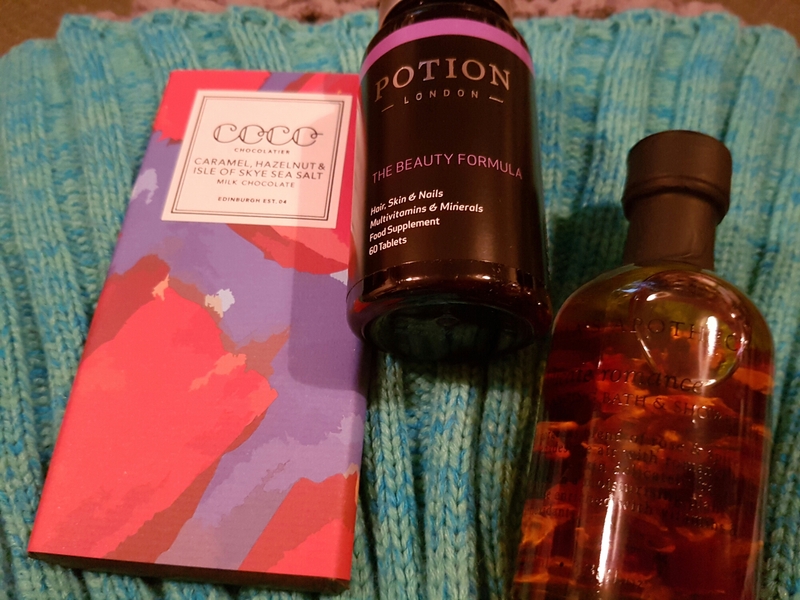 This smells delicious and soon so will I.
Potion London The Beauty Formula (RRP £25 60 tablets – 1 a day) – with 19 vitamins and minerals these skin, hair and nail supplement tablets are developed to promote clear skin, strong nails and silky hair. Stocked in Harvey Nichols exclusively (and online), it’s only been around since July last year. It would be really great to see if these help my brittle, peeling nails. Pia Rossini Monroe Faux Fur Snood (RRP £30, available in 7 colours) – lined with soft fleece, this ridiculously stroke-able snood is warm and cosy. There are matching accessories available online. I am wearing this in my living room – the boiler’s broken and can guarantee it’s warmth. Based in Northern Ireland, the husband and wife team cover all seasons with everything from faux fur to beachwear. 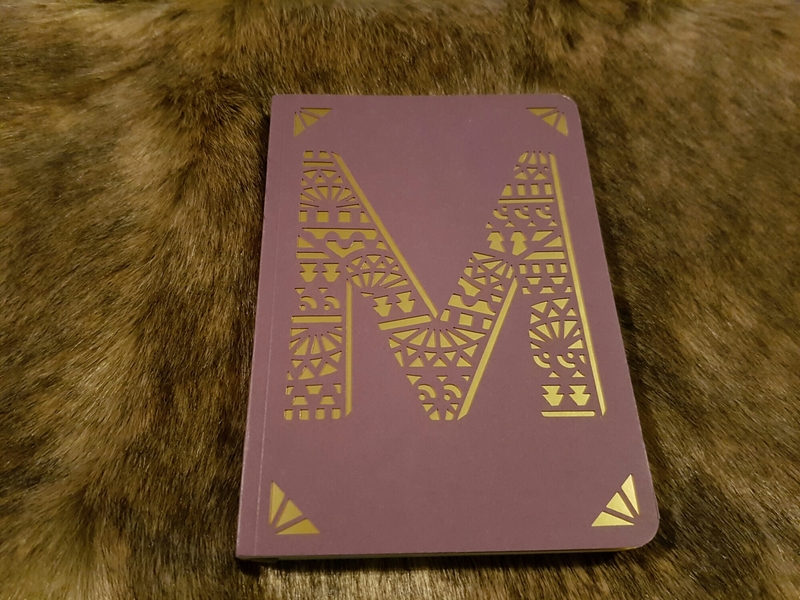 Portico Designs A6 Monogram Notebook (RRP £8) – this stationery brand produce gorgeous products for brands including Wedgwood, Monsoon and Roald Dahl, as well as their own designs – like these gorgeous notebooks, which come in a range of colours. 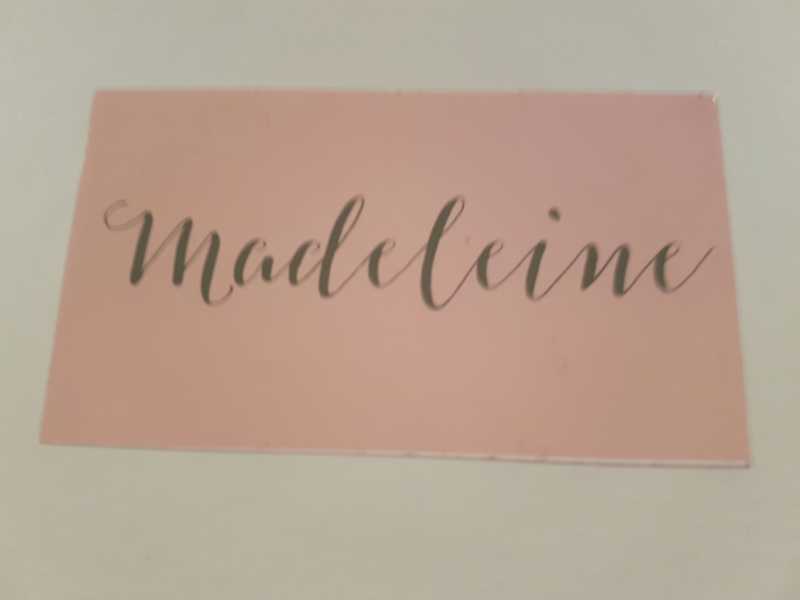 A 25 year old, Bath based company, their lovely things make brilliant presents. As someone who is always scribbling things down, this arrived at a perfect time. 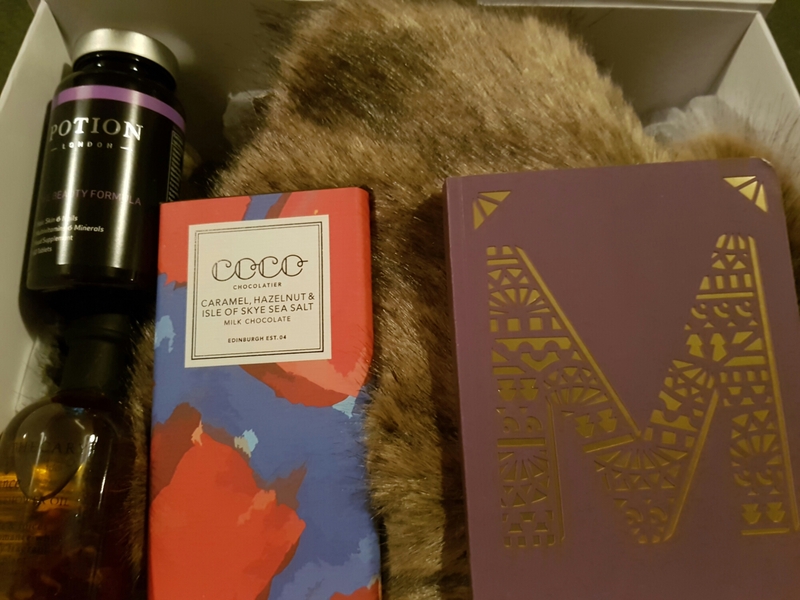 Coco Chocolatier Organic Chocolate Bar (RRP £4.50 for 80g) – Caramel, Hazelnut and Isle of Skye sea salt milk chocolate – an artisan chocolate bar from Edinburgh with really lovely packaging, combining some of my favourite things – sorry I don’t share! Are you a subscriber? Do you love these boxes too? You know where I am, wearing my snood and eating chocolate.